2 weeks in a row – that’s pretty good for me right now. Getting some words down, trying not to edit, but I catch myself every now & again. Linky to WeWriWa, because there’s always fantastic excerpts to read there. My 10, from the WIP Renegades; Book 2 of The Wildblood. The usual promo links. Check ’em out! Both books are on sale this week. And my website, S. A. Hoag, Sci-Fi With a Streak of Rebellion, where you can find links to other formats plus new excerpts and info about upcoming releases. Blurbs – Who Knew How Tough They Are to Write? I still look at the blurbs for The Vista and want to tear my hair out. They aren’t at all what I’d like them to be – in a word, perfect. I’ve seen blurbs that are. Sharp and flashy, that hook that draws readers in. Mine seem like monotone tan boring prison walls. So, Renegades; Book 2 of The Wildblood is finally back in progress. I’m looking at a Feb., 2016 release date, barring any more Real Life train wrecks. I’ve come up with the first tag line. No idea how long it will last, but here it is. Forfeiting everything they’ve established in The Vista, Team Three scatters across the Front Range in an attempt to determine where their enemies are hidden and if they have any true allies. I think it sets the tone, and even if the reader hasn’t seen previous books in the series, they should be able to start here and understand the progression of the storyline. If you’d like a quick read, the prequel is approx. 75 pages. The Vista; Book 1 of The Wildblood is a bit more ambitious, a full-on novel at approx. 350 pages. Part of the first generation post-World War 3, Shannon Allen, Alex MacKenzie, and Geoffrey Wade are Team Three, Vista Security’s top officers. They know they are different, far beyond their elite training. It’s a secret the struggle to contain in the microcosm that is The Vista. Problem is, there’s something out there, just beyond The Vista, watching them. As Vista Security, they are sworn to protect; as Security Command, Team Three may be forced to break those oaths to save everything they’ve ever known. Lastly, my website, S. A. Hoag, Sci-Fi with a streak of rebellion. You can find links to all the formats the books are in there. It’s easy to navigate, too. After several weeks hiatus, I’m back. Hopefully on a weekly basis, but I’ll just have to see how Real Life is going. First, here’s a link to WeWriWa. Go check the page out, it has lots of links to snippets. Highly recommended! And now my 8, or 10. Maybe 9. This is a WIP, Renegades; Book 2 of The Wildblood series. “I need to be here – this is the flashpoint. I need to know the Cody base is secure, just in case,” Wade told him, pulling no punches. “Is Shannon going to The Vista?” Taylor asked. “That could be dangerous.” Taylor was thinking ‘exile’ and hoping he was wrong. OK, it was 10. 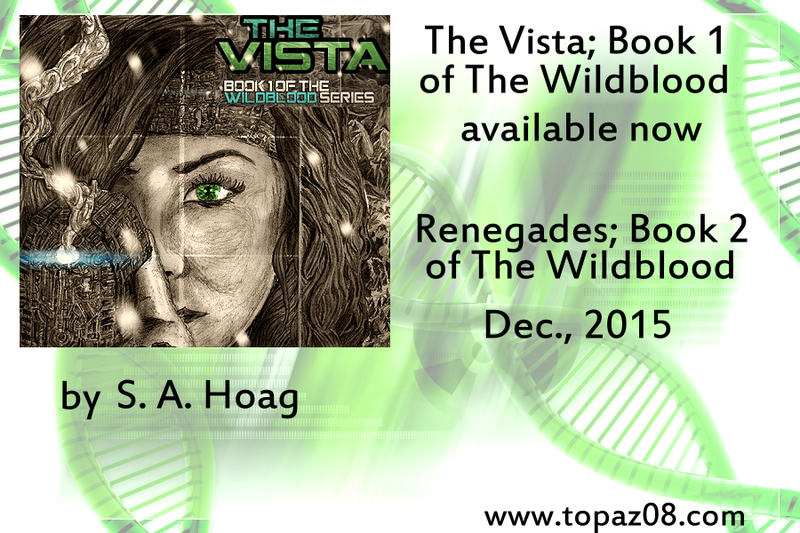 Here’s the promo to go with it and a link to The Vista; Book 1 of The Wildblood. Maybe because of my recent distraction and maybe not, Book 2 of The Wildblood series is proving to be . . . interesting. Yes, that’s the word you use when you don’t want to say something negative. It’s really not a negative thing, just far different than Book 1 was. It has name, now – ‘Renegades’. I looked up the number of books on Amazon with that name, and there were many. With the series name tacked on, I don’t see a problem. The problem was, my characters were fiddling around with no real goals. Their individual conflicts needed a focal point. I’ve contemplated it for a couple of evenings. What are their short-term goals? Long-term goals? Personal goals? One antagonist kept ending up on my short list. So be it. If I’m going to call it ‘Renegades’, I’m going to make them exactly that. Now, you didn’t think I’d include any real spoilers, did you? Point is, I’ve got that ah-ha moment I lost sometime in the process. I’m also getting the cover lined up and hoping I can still get this one out by my self-imposed deadline of December. Time will tell. Here at home, my husband is doing well. He had some surgery and now he’s looking at 6 months of low dose chemo as a precaution. All this has him a bit depressed, but we think it will pass soon. I hope to have a draft for him to read soon. I know some spouses would sugar-coat a critique. Not him, which is why I let him man-handle that first draft for me. Alrighty then, a promo is in order. With a tiny bit of luck and a bit more ambition, there will be a snippet this weekend. You’ve been warned.